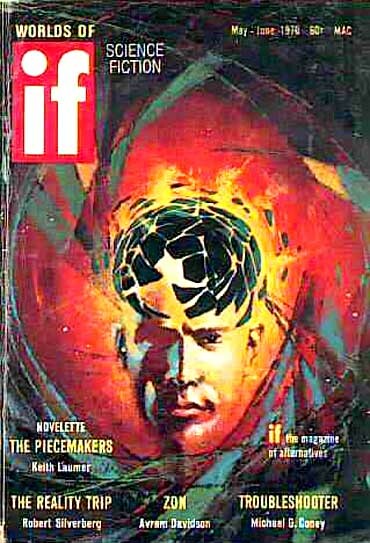 I’d read “Troubleshooter” before, many years ago, but returned to it now with no memory of the story. Having read it again, I understand why. It’s a very minor, pedestrian piece about DeGrazza, the troubleshooter of the title, who works for Galactic Computers. When ships belonging to aliens from Altair begin malfunctioning, the aliens blame Galactic Computers, and the company sends DeGrazza to find out what’s going wrong. The Altairean ships are fitted with both Terran computers and their own organic ones – made from the aliens’ minds, which are telepathic. DeGrazza, a troubled soul plagued by nightmares, solves the problem, and is thanked by the aliens: “Goodbye, DeGrazza of the tortured mind and plunging compulsions. […] You are so immersed in self-pity that you are hardly aware of those around you…” which, it is hinted, is why he makes a successful troubleshooter. The problem with “Troubleshooter” is that DeGrazza’s character is not successfully integrated into the story – we’re told what he’s like, not shown. Also, the plot is perfunctory. In later tales, plotting will become Coney’s marked strength. Well, that’s most kind of you, Bob. I am missing a few of his tales in various magazines. Give me a few days and I’ll get back to you on what I need, and we’ll see if you have them. I could do you an exchange for copies of my own books, (if you’d care for them, that is!) Thanks again, and all the best.